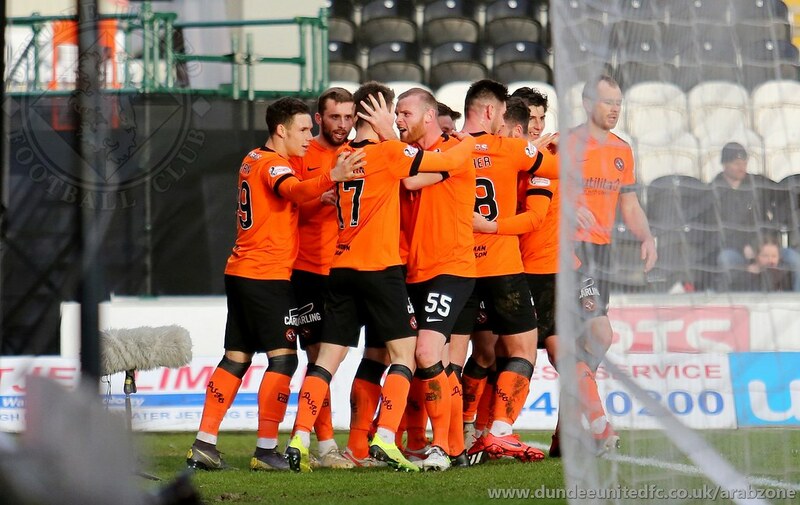 Dundee United progressed to the quarter finals of the Scottish Cup following an action packed victory over St Mirren in Paisley. In a first half almost entirely dominated by United, it would have been difficult for the neutral onlooker to recognise the Premiership team from that from the Championship. As it was United finished the half two goals to the good, following goals from Safranko and Clark. United's first was generated in a move typical of the drive displayed in that impressive first half. A powerful run and cross down the right by Seaman, following a nice feed from Pawlett, led to a Clark header being saved. The rebound fell to Safranko, whose shot was also saved, before it fell to Pawlett just outside the box and his drive deflected off Safranko past Hladky into the net, sending the 1500 strong United support into raptures. St Mirren were struggling to cope with United's energy coupled with several delightful though passes, creating chances for Seaman, Butcher, Pawlett, Clark, Smith, Harkes and Safranko. Credit to St Mirren's defence at this stage, with several crucial blocking challenges, as United threatened to run riot. The St Mirren defence was finally breached again on the stroke of half time, with a richly deserved second and ultimately decisive United goal. A ball from Robson over the St Mirren defence gave Nicky Clark the opportunity to chase down. Showing good strength to get the better of the St Mirren defender, he beautifully lobbed Hladky with the shot dipping under the bar and into the net. Superb goal! The whistle blew soon after for half time. 2-0 for United, 12 shots at goal and many more attempts blocked. The second half became a more physical affair, which was broken up by a series of niggling fouls. However, the direction of the game changed in a four minute period with half an hour to play. First St Mirren were fortunate to survive a dismissal, when McGinn took out Cammy Smith, but survived with a booking. Then Calum Butcher was shown a straight red card from referee Colum for a high tackle on Flynn. It looked harsh, with both players feet high as they attempted to win the ball. St Mirren, realising an unlikely comeback was now on the cards were lifted. Within two minutes, Popescu cracked a shot off the underside of the bar to the relief of all in tangerine. Robbie Neilson rang the changes to adapt to a 10 man set up, with Sow and Gomis on for Smith and Clark. It was now St Mirren's turn to pile on the pressure, but credit this time to United's defence who looked to be absorbing all that St Mirren could muster. However on 77 minutes St Mirren scored, to set up an anxious last period for United. The danger appeared to have been cleared, but the ball fell to Nazon, whose speculative shot took a huge deflection off the unlucky Connolly into the net. St Mirren could now sense Cup salvation, with 10 man United continuing to defend in numbers. The St Mirren pressure was intense, without creating any clear opportunities, but United also had a rare glimpse of goal when Sow fired a low drive, forcing a corner from Hladky. With a full five minutes of injury time played the referee blew for full time, sparking joyous scenes from United players and fans alike. Summary: In a first half entirely dominated by a very impressive United, against Premiership St Mirren, a two goal cushion was the least the team deserved and was ultimately enough to counter St Mirren's fight back. But for the game changing sending off of Calum Butcher, a more comfortable afternoon may have been had for the team and the fantastically vocal 1500 Arabs. Man of the Match: There were so many contenders in the first half that it would have been hard to pick out one player. In the second half it was the defensive qualities which impressed. But for impact over the full 95 minutes, Man of the Match goes to Charlie Seaman whose drive and interventions were crucial to seeing United over the line and into the Scottish Cup quarter finals.